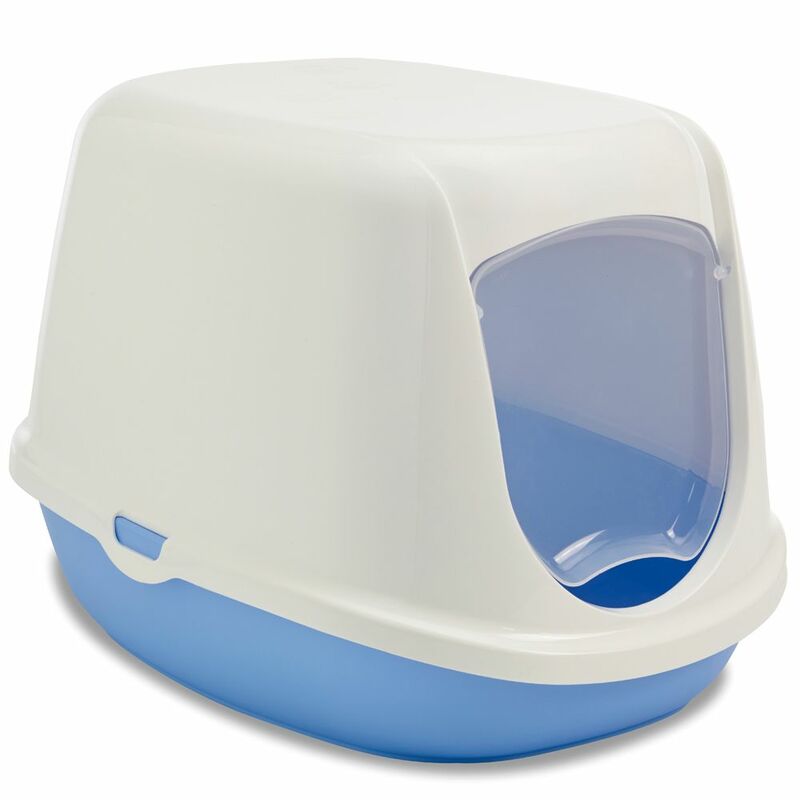 This Savic DucheΒe Litter Box makes the perfect training toilet for small cats and kittens. The covered litter tray helps to keep your house clean and hygiene. It is easy for your cat to find its way inside, thanks to the transparent swing door over the opening. This means that the Savic DucheΒe Litter Box is ideal for getting your young cat used to the idea of going inside a closed litter box through an opening. The blue tray has high edges at the back, guaranteeing that nothing makes its way outside of the tray and that all litter and waste remain firmly inside. The white cover complete with front flap is easy to remove, making it simple to change the litter and easily clean the plastic tray. The lid of the Savic DucheΒe Litter Box can be easily replaced with just a click, then remains firmly and safely in place. A cute little paw print design on the top of the Savic DucheΒe Litter Box makes this tray an adorable acceΒory for your four-legged friend. It is not only functional but also extremely cost-effective. Savic DucheΒe Litter Box at a glance: Covered litter tray for kittens and small cats Ideal for toilet training or to get your cat used to a covered litter tray Swing door with gaps: the small opening with the light, transparent front flap invites your cat to come easily inside Safe and hygienic: with a plastic under tray to prevent litter or waste flying out Removable cover: the cover with swing door is easy to remove and can be simply replaced with a click Easy to clean: the tray is made of plastic and the removable cover allows easy acceΒ to the litter Cute design: with a blue under tray and adorable paw print design on the top Cost-effective: a functional acceΒory Reliably sourced: made in Belgium by pet supply specialists Savic Colour: white, blue, transparent Material: plastic Dimensions: Total dimensions: 44. 5 x 35.5 x 32 cm (L x W x H) Tray: front 6.5cm, rear 11.5cm Entry height: 8cm Entrance: 17.5 x 20 cm (W x H) Sizing for Savic Bag it Up Litter Tray Bags - Medium: Suitable for trays up to: 42 x 32 cm (L x W) Contents: 12 bags More information about Savic Bag it Up Litter Tray Bags can be found here: Savic Bag it Up Litter Tray Bags. Price just £1.99! Click here to buy now!